In the first half of 2016, NECG was involved in the CINTAC Nuclear Financing Workshop, the JAIF Annual Conference, and the IFNEC Nuclear Finance Conference. Edward Kee was a panelist at the CINTAC Global Nuclear Energy Financing Workshop on “Views from the Financial Community.” Mr. Kee noted the need for government involvement in nuclear power projects to provide long-term financial feasibility. 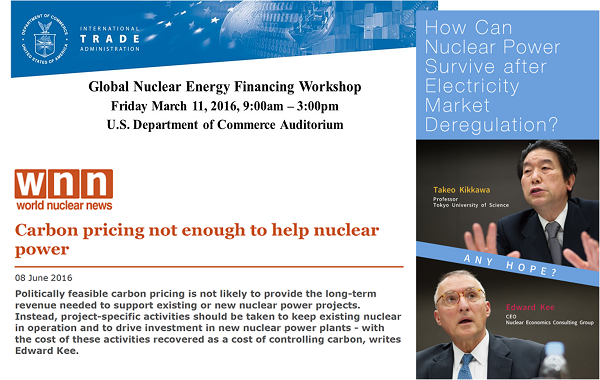 This feasibility may be difficult for private nuclear power projects in electricity markets. Edward Kee made a presentation, World experience with nuclear power and electricity reform (PDF), at the Japan Atomic Industrial Forum (JAIF) Annual Conference in Tokyo. The IFNEC Nuclear Financing Conference was held on the 11th and 12th of May. During this event, Edward Kee took the role of an advisor to the Energy Minister in two case study exercises, one for a country building its first nuclear power plant and one for a country trying to keep and grow a nuclear power fleet in a restructured electricity industry and electricity market. Thanks to Claire Louise Isted at WNA for suggesting this and helping get it done.